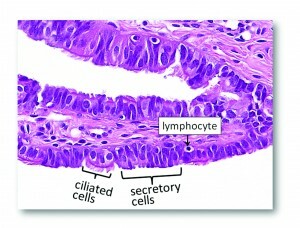 Note: The cells in the mucosal layer of the fallopian tube include at least the following cell types: secretory cells (BCL2 positive), ciliated cells (p73 positive), intraepithelial lymphocyte (or other immune cells) and, theoretically, the somatic stem cells that have not yet been identified and defined. The morphology of the fallopian tube epithelium varies from region to region and from case to case. 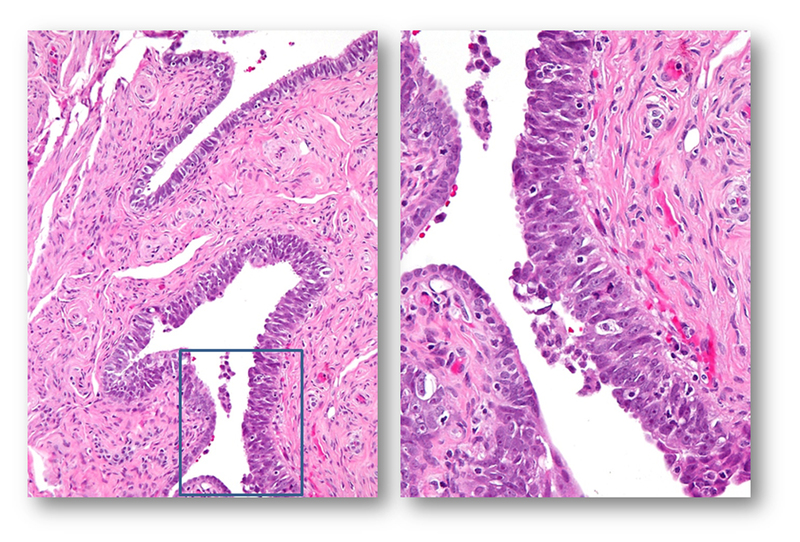 One may wish to establish his or her own reference of what is “normal” by carefully reviewing normal fallopian tubes by microscopy. 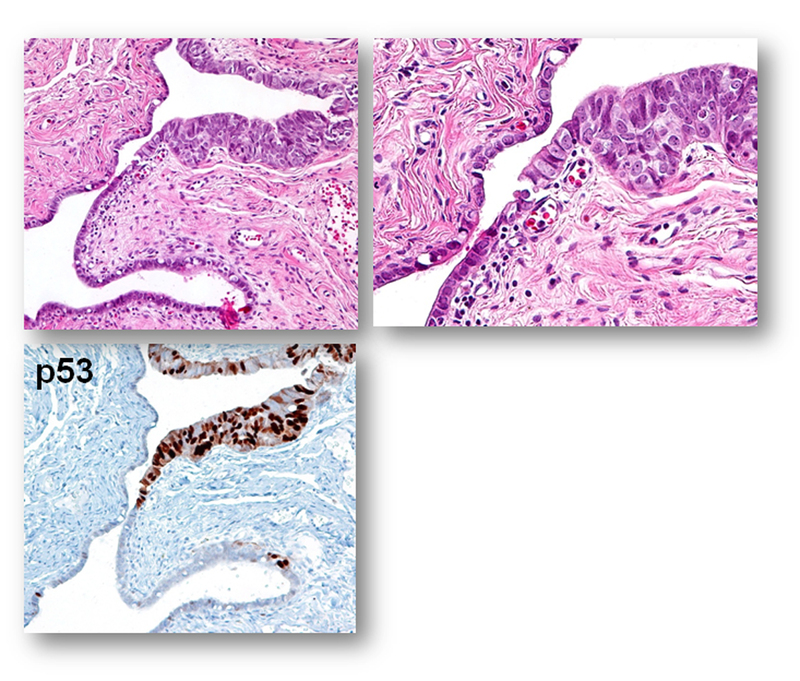 It is not uncommon for a pathologist to overcall normal/reactive epithelium as “suspicious” or even “unequivocal.” Here are some examples of photomicrographs from normal/reactive fallopian tube. 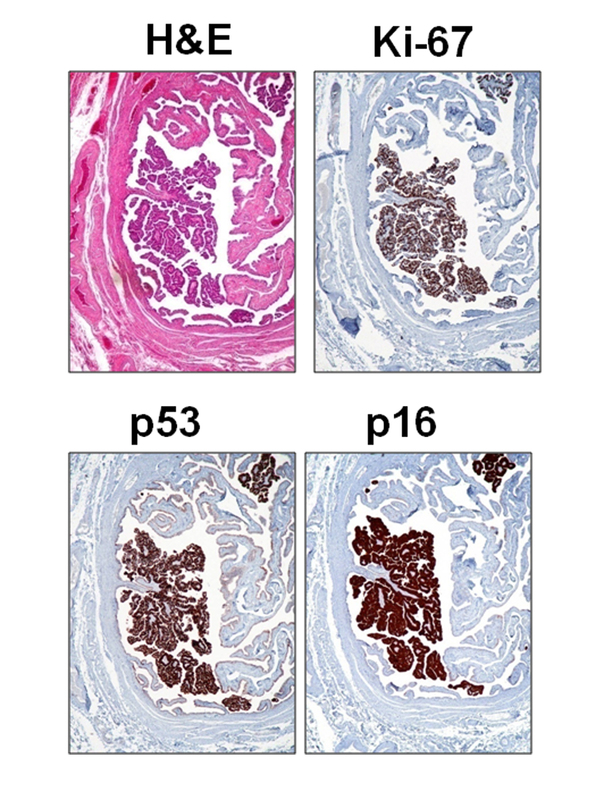 The Ki-67 labeling index is low (<5%), and p53 is negative in those regions shown. 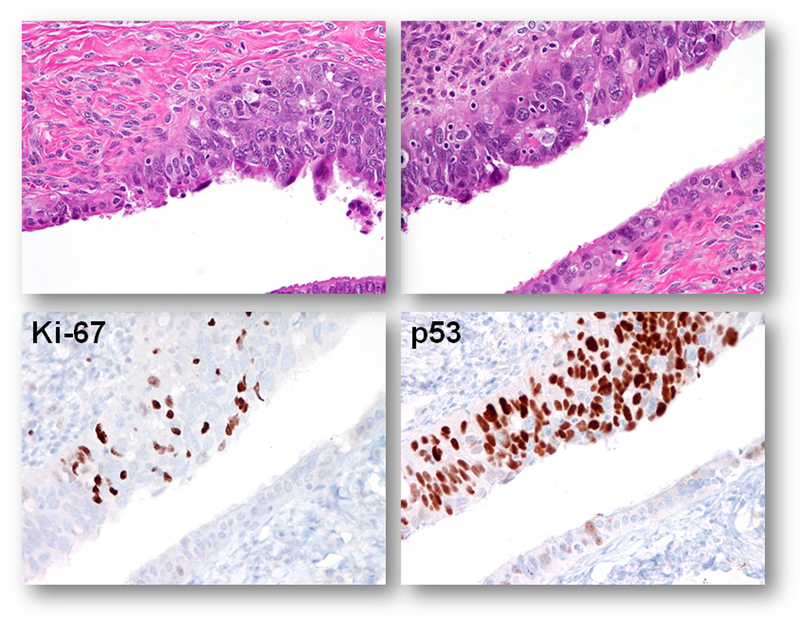 Although there are features such as (pseudo)stratification and nuclear enlargement, the mitotic figures, apoptotic bodies (not to be confused with intraepithelial lymphocytes), prominent nucleoli, and loss of polarity are virtually absent. 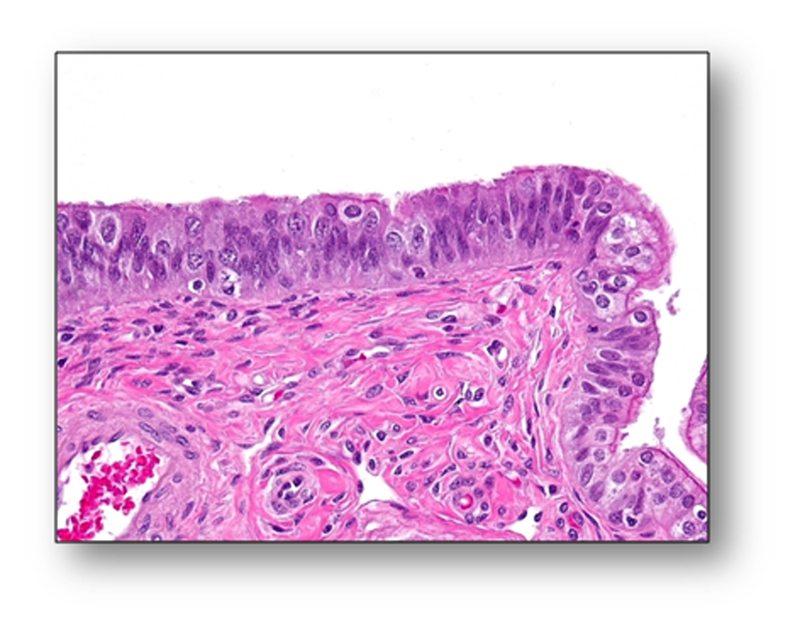 Please click NFTE to view H&E sections of normal/reactive tubal epithelium. As a comparison, please click STIC to view H&E sections of STIC. 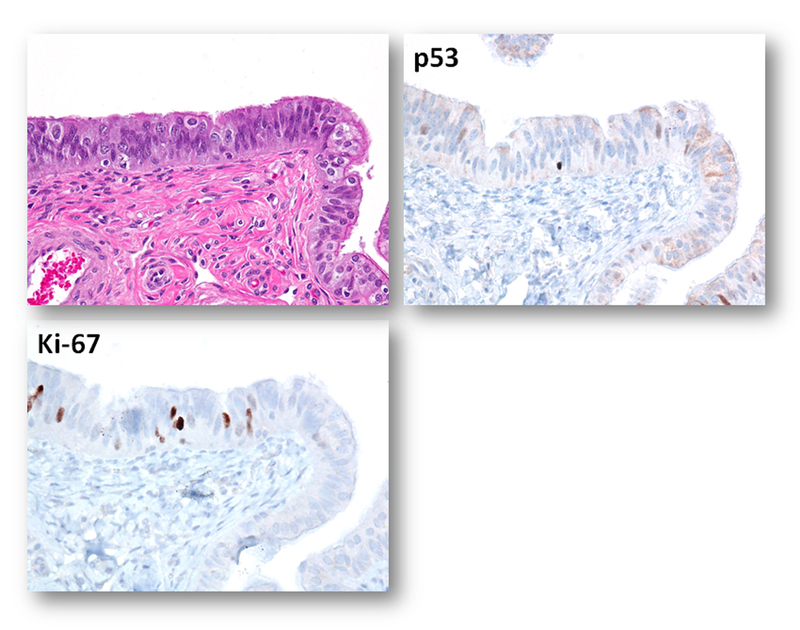 Sometimes it is not easy to determine if the morphology is normal/reactive vs. suspicious. 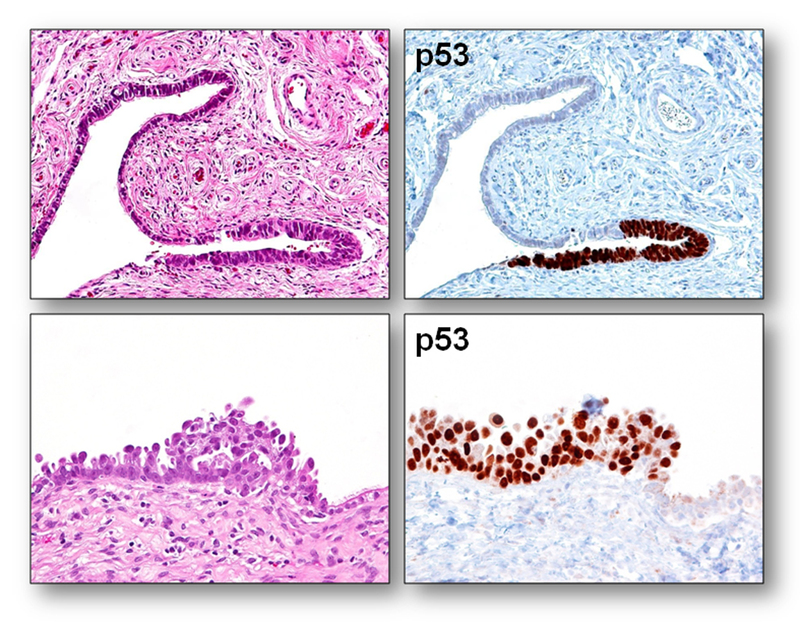 IHC with p53 and Ki-67 can be useful. The photographs shown below illustrate such a case. 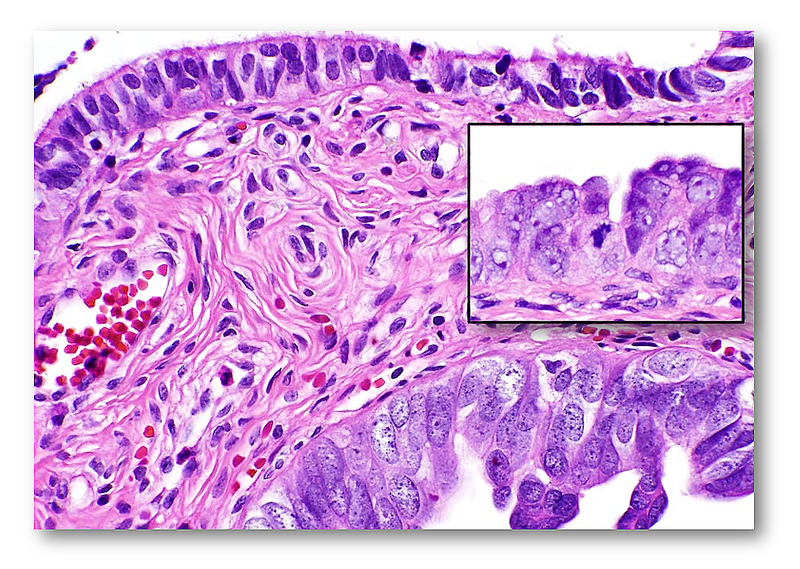 The morphology may be interpreted as either normal/reactive or suspicious (some stratification, mild nuclear enlargement, polarity issue, but no apoptotic bodies, mitoses, or prominent nucleoli). 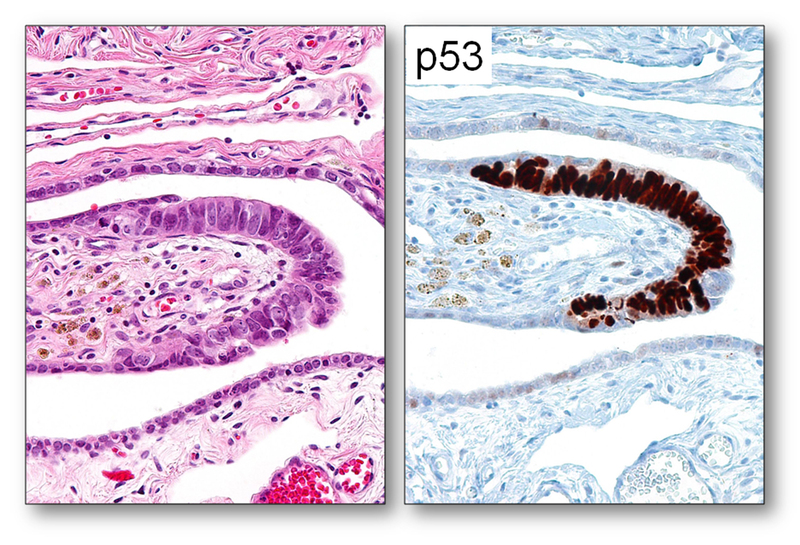 p53 staining is negative, and Ki-67 labeling index is slightly above 10% mark (13-15%). Thus, depending on morphology, it can be diagnosed as normal/reactive (if morphology is not suspicious) or STIL (if morphology is suspicious). Note: This represents another extreme of the lesion entity and the diagnosis is usually not a problem. Note: Architecturally, STIC can be exophytic or flat, and can be multi-layered or single-layered. Cytologically, they usually demonstrate the following features: nuclear enlargement, prominent nucleoli, mitosis (sometimes abnormal ones), and apoptotic bodies (not to be confused with intraepithelial lymphocytes). 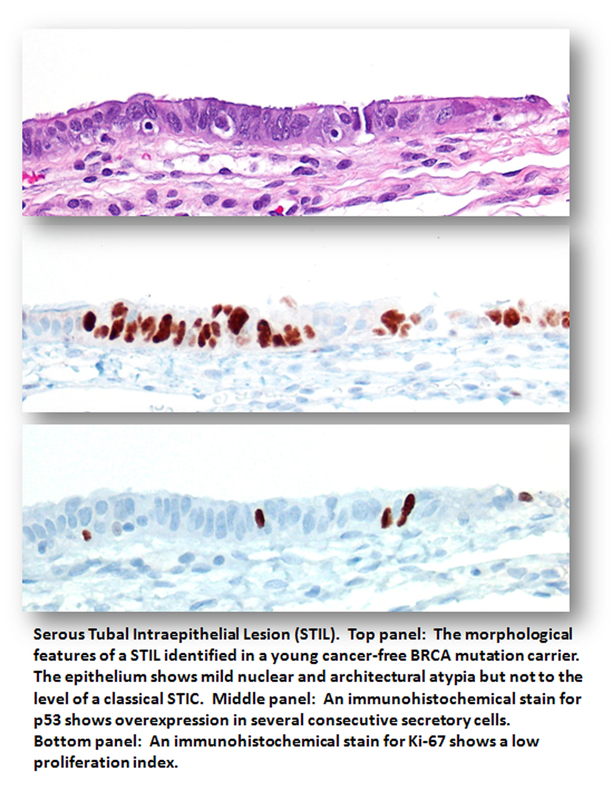 Additionally, stratification, nuclear molding/tufting, and loss of polarity in multi-layered lesions are common but are not as important as mitosis and apoptotic bodies (vanishingly rare in non-STIC tubal epithelium). 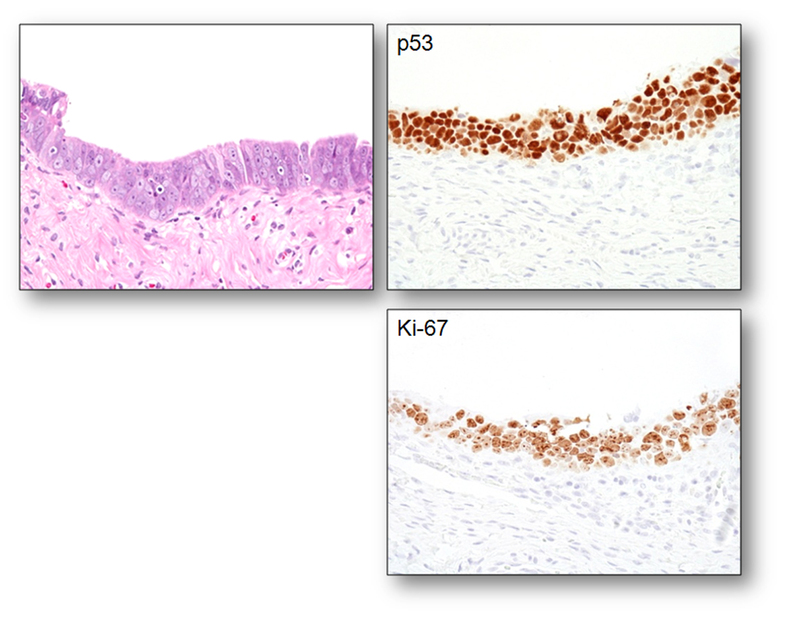 Immunohistochemically, STICs are positive for p53, and the Ki-67 labeling index is > 10%. 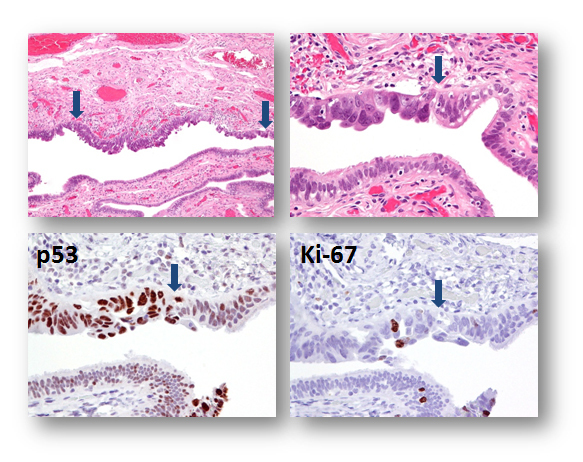 Because the lesions are usually small, counting the Ki-67 index could be very useful.